My attention was drawn to a section of colour film about what seems to be a funeral in Glenbuchat in 1946 taken by Annie Taggart. Annie Watt Taggart nee Ross, was born June 13, 1904 in Aberdeen and died in 1977. She was a descendant of the Ross family in Glenbuchat Jane Ross was probably her great aunt. 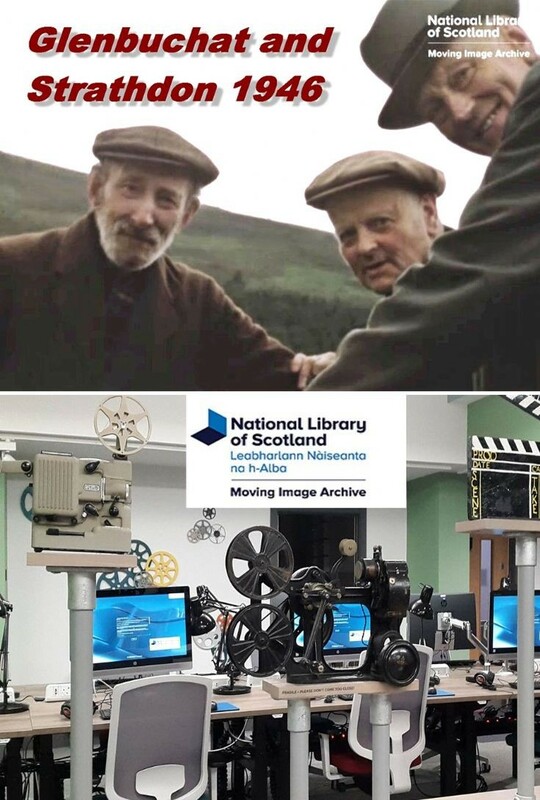 I am grateful to the Library of Scotland for permission to link the film and show screen shots from it. Further pages in this album show screen shots from the film. The film contains family scenes at Glenbuchat in 1946 probably at a funeral or memorial service at the church. The later part of the film relates to non – Glenbuchat family images. Family film showing family members at church, young daughter at college and even younger children at nursery school. Black and white footage of a younger family members school sports day. Taggart family owned a granite yard up until 1956 when they sold up, bought a farm at Marywell on Deeside and moved from the city to the rural life. Mother, Nannie, and daughter Nan, chronicled the early years of their new lives on the farm on film. Nan Taggart and cousin Glen Ross interviewed about the films on ‘THE WAY IT WAS’, Grampian TV, transmitted October / November 1994. From other links in this web site, the church service shown in the film would appear to relate to the death of Jane Ross and many of the people shown will be her family and friends from Glenbuchat. Jane Ross of Baltimore farm Baltimore Farm died 25th June 1946 Aged 84 Years. She was the daughter of William Ross of Baltimore Farm and may have also been called Jean.